Ever joined a pregnancy group or discussion thread and felt like everyone was speaking a foreign language?! To speed things up a lot of acronyms get thrown around in these groups. 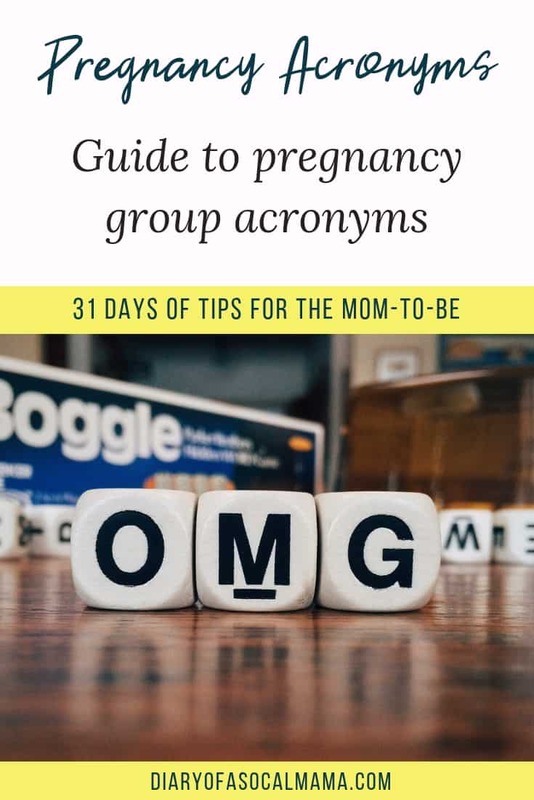 Use this guide to help you decode these pregnancy acronyms and abbreviations so you can join in on the conversation. I’ve included not just acronyms but other common terms as well that the layman may not be familiar with. This is post 7 in my series, 31 days of tips for moms-to-be. BLW – Baby led weaning. A way to introduce solids to your baby. BM – This one is tricky. It can mean bowel movement or breastmilk depending on the context. You’d be surprised how quickly you can start discussing BMs, yours and your child’s, with your new online friends! Co-sleeping or bed sharing – Sleeping with your baby in the same bed. EBF– Exclusively breastfed. A baby who receives breastmilk only. Sometimes women mean the baby breastfeeds only, others mean baby receives breastmilk only but may sometimes get a bottle of breastmilk as well. EP – Exclusively pumping breastmilk for your baby. HCG – A hormone produced during pregnancy. Some women will receive blood tests early on to measure their levels of HCG which will double about every 72 hours through the first couple months of pregnancy. PNP – Pack n Play, also referred to as a play yard. A space for baby to sleep or play. Room sharing – Having your baby in the same room but in their own sleep space such as a bassinet, crib, or pack and play. Trigger warning – Ok, so this one isn’t an acronym, but it’s still important to know. Anything related to sensitive topics such as suicide, child death, miscarriage, etc should be posted with trigger warning then a series of dots underneath to create space before posting your comment or question. This makes it so someone has to generally click read more to see it. Traumatic issues like this can be triggering for some women. VBAC – Vaginal birth after C-section. This is actually a big deal and you have to meet certain criteria for a doctor to agree to let you try this. Want to save this list for later? Grab the Printable Pregnancy Acronym Guide. I’m sure I forgot several on this list. If you think of one that’s not here, or have a question about one, please leave it below so I can update the list! For more great pregnancy tips check out the full list of topics in my 31 days of tips for moms to be series. Oh my goodness this is so helpful. I was reading so many comments from people and it took time to understand what they were saying. I’m the worst at using acronyms! This is great!